Arch Linux is not a Linux Operating system for distro hoppers. It’s that kind of distro which once installed, you forget about formatting your hard drive and doing a fresh installation all over again. 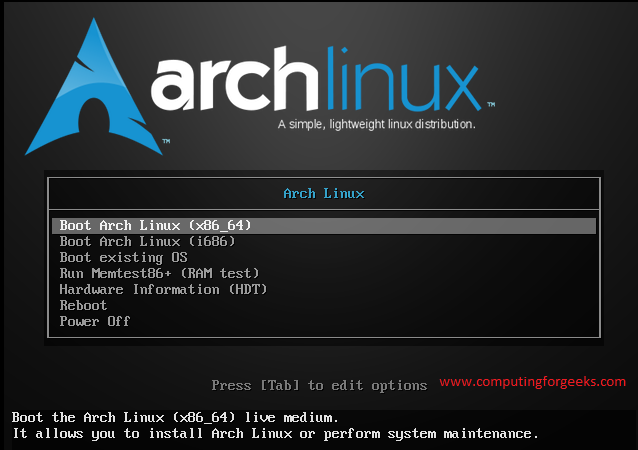 In this tutorial, we’ll look at how to install Arch Linux. Arch Linux and its derivatives are rolling release, meaning you get fresh packages from upstream as soon as they are released. It is not a bloated distro: Arch doesn’t ship with software packages that might not be of any use to the user. Arch let you install only the things you really need, this let you strip unnecessary features that comes by default with many Linux distros like Ubuntu, Fedora, OpenSUSE e.t.c. You build a lean and fast system. AUR ( Arch User repository) is really amazing, easy and peasy. It gives you access to lots of software packages not available in official repositories. This is a plus as compared to other Linux systems.You can use PKGBUILD without any manual intervention. Pacman package manager that automatically compile packages for you. Arch has a very detailed wiki making it best Linux reference, not only providing Arch Linux tutorials and how to, it gives you general Linux knowledge. 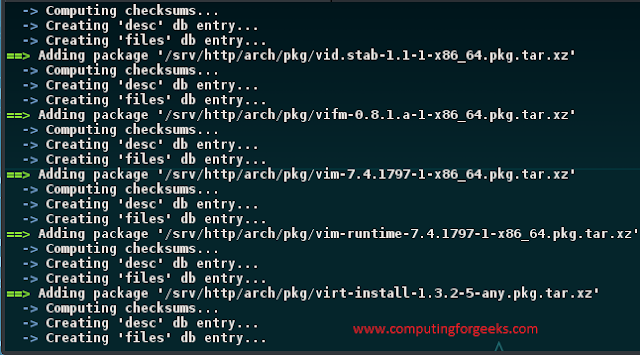 How to install Arch Linux is a bit complicated as compared to many other Linux distributions. 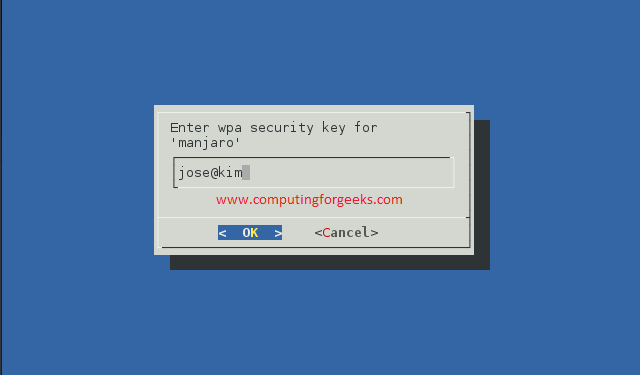 There are projects aimed at simplifying Arch Linux installation, these include Manjaro, Antergos, Apricity,Ninja and many others. You can try simplifying installation of Arch Linux with those distributions if you don’t have all the time to build your Arch from the ground up. This mini-ebook was written to help you build your own Arch Linux desktop or server without the need of pre-build distros. I will provide here overview of the common ways to boot the installation media and get started. Remember that any installation of Arch needs an active internet connection since its installation process retrieves packages from a remote repository. You can do an offline installation of packages but I don’t recommend this method since it requires deep understanding of Arch Linux and Linux system in general. Most guidelines provided here are simplified wiki’s. You can use my ebook alongside Arch’s wiki documentation. I’ve used a lot of screenshots and pictures for illustration purposes and to help new users follow along easily. 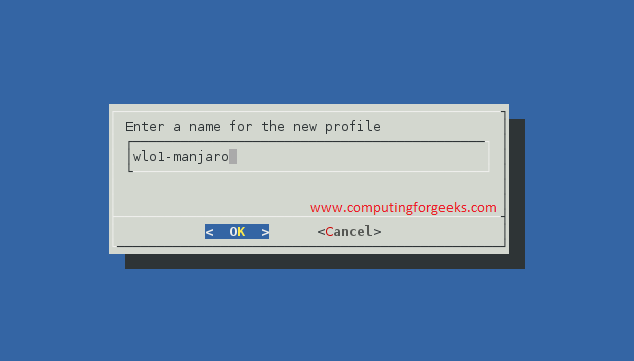 If you’re installing an Arch-based Linux distribution like Manjaro or Antergos, you may have to skip some parts of this section because they do offer GUI installer. It is a point to note that Arch installation is done in text mode (using terminal) only. You can install Arch using bootable DVD or USB flash drive/key/stick for booting in BIOS and UEFI systems. A LiveUSB, LiveCD system can be used for installing Arch Linux, perform system recovery or maintenance. It is to be noted that live media uses SquashFS which discards all changes once the computer shuts down. Complete steps of installing Arch Linux are as outlined below. 1.1.1: Create bootable USB flash stick on a Linux system. The best tool to create a bootable ISO on a Linux host is dd command. Make sure you’ve selected correct drive before issuing dd command, failure to may render your external storage drive unusable. I recommend you use lsblk command to confirm usb drive. 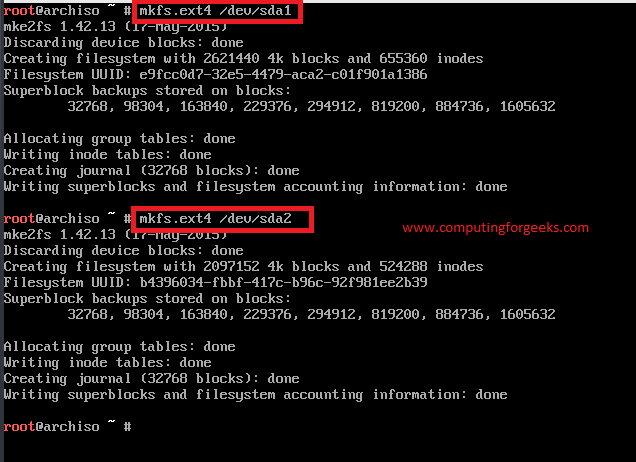 Below example will create bootable arch from iso located in /home/josepy/Downloads (input file) to device at /dev/sdb ( output file) , using block size of 4M, showing transfer progress and doing sync to complete before ejecting. I suppose you have a flash drive with targeted partition as /dev/sdb2 that must be formatted to FAT32. 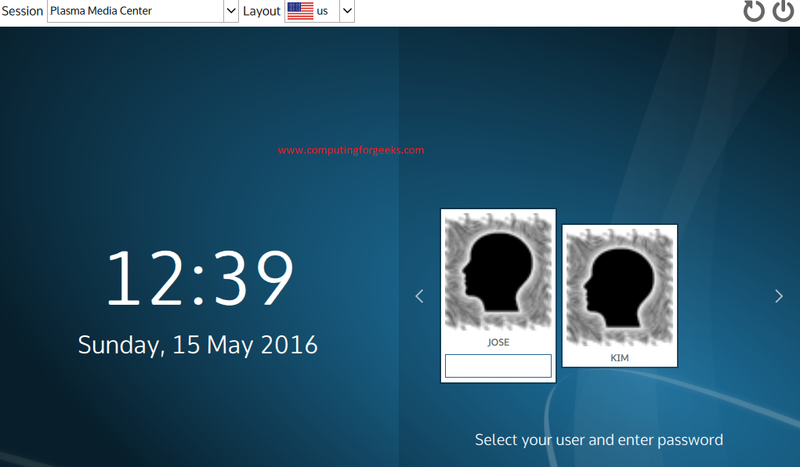 We’ll create a directory to mount Flash drive partition and ISO image. 1.2 Create bootable USB flash stick on Windows. The file system of FAT32 is required. Once you’ve created USB drive that’s bootable, plug in and start the system. Choose ” Boot Arch Linux ( Architecture)”, since my machine is 64-bit, i will choose ” Boot Arch Linux (x86_64)”, then press enter key. Now it’s time to start partitioning hard drive. 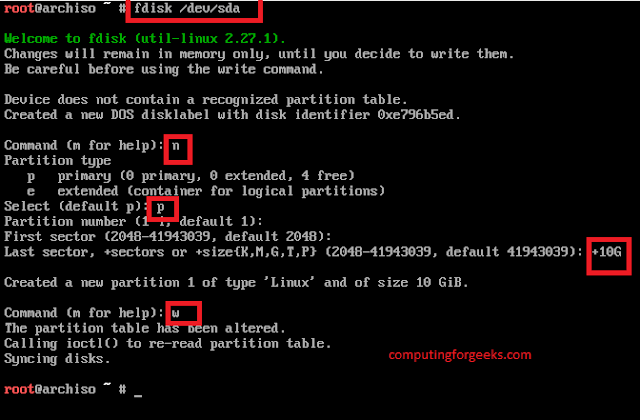 Type w to write changes to the partition table. 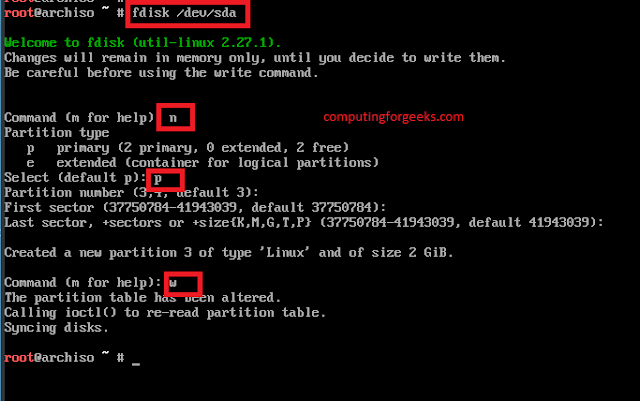 Repeat the same procedure as in 1.4.2 and 1.4.3 to create a swap partition. Create swap and turn it on. Before you begin installation of base packages, it’s advisable to choose mirror closest to you. 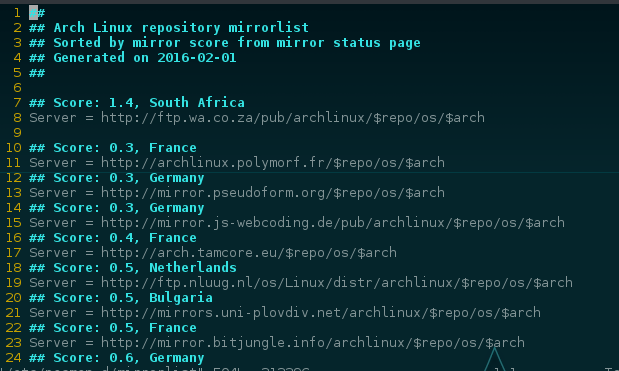 You can do this by editing the mirrorlist file located in /etc/pacman.d/ directory. Ctrl+X: To save changes, then press Y then enter key. It will be the first one in the mirror list. 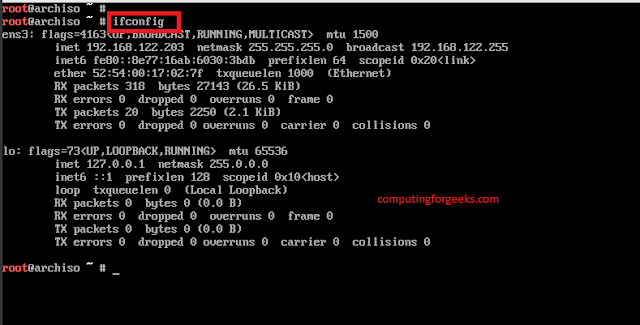 > Check if you have an ip address, if not and have DHCP, request for IP related information. On the popup window, Select your Wireless network then Press OK. If it has security key, enter it and press OK.
Pacstrap installs packages to the specified root directory. If no packages are given, packstrap defaults to the “base” group. NOTE: THIS IS NOT DONE ON THE INSTALLATION MACHINE !!! Next step is to create directory to house pacman packages on installed Arch Linux Apache’s root directory. Rsync all packages at /var/cache/pacman/pkg directory to /srv/http/arch . Change group ownership of /srv/http contents to http. 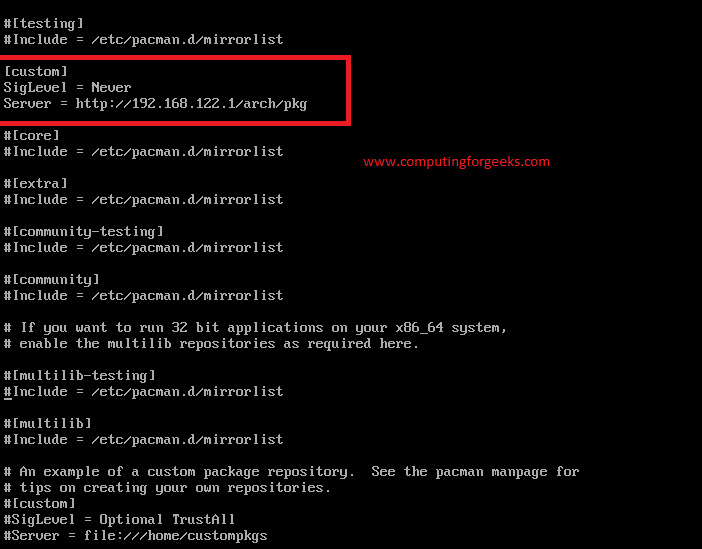 Use repo-add command included with Pacman to generate a database for the custom repository. After successful installation of base packages, you can move on to system configurations stage. fstab is a static information about the filesystems which contains descriptive information about the filesystems the system can mount. It is only read by programs. It is your duty to properly create and maintain this file. Arch installation comes with a package called genfstab which tries to automate this process for you. genfstab generates output suitable for addition to an fstab file based on the devices mounted under the mount point specified by the given root. You can check generated fstab file and modify if necessary. You can find your timezone by going through the list of timezones. Since i’m using US english, my locale will be set to en_US.UTF-8. Uncomment multilib repository to look like below. This is necessary if you’re running 64-bit system and would like to install 32-bit packages on it. Add the following AUR repo content at the end of pacman.conf file. Install Grub bootloader. Since this installation of Arch is on PC using BIOS, we don’t need a different partition to install bootloader on. If you’re using UEFI, consult Arch Wiki for details on how to set it up. 3. Install Mesa 3D acceleration if you don’t want to install proprietary ones. Net-tools package provide network management tools. Arch comes with ifconfig replacement tool ip. To use ifconfig, net-tools package is required. Sudo allows a permitted user to execute a command as the superuser or another user, as specified by the security policy. Dhclient, provides a means for configuring one or more network interfaces using the Dynamic Host Configuration Protocol and BOOTP protocol. Enter your desired password and confirm. Add new user to the system. Enter desired password for the account and confirm . All linux systems are Desktop Environment agnostic. You can install any DE you want, at any time. I’m a big fan of KDE but i’ve used almost all Linux DE. In this section i will guide you through installation of top Linux Desktop Environments. The list is as shown below. Upto this point, you’ve finished install Arch Linux on your machine, so, Kudos!!. You can now exit chroot , unmount partitions and reboot your system. While it’s rebooting, you may eject installation medium since install Arch Linux process is complete. Upto this point, We’ve completed a how to Install Arch Linux, if you’re here i know you’ve a running Arch with DE. 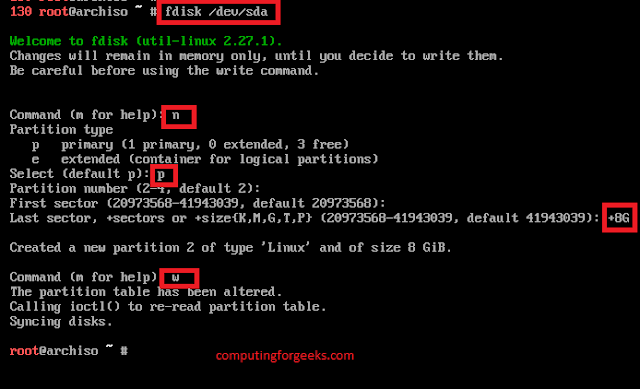 Computinforgeeks have many tutorials on Linux and Arch Linux. How to install KDE, XFCE, GNOME 3 and others.